Broom Sunday Open 02 September. Weather was ideal to start with overcast with a nice ripple on the water. Lots of fish up in the water ideal pellet waggler day? Nope……. 12 anglers fished so decided to have 3 mini sections on Queensberry. Section 1, 16 -19 section 2, 21 – 24 and section 3, 26 – 29. Section 1 was won by Broom regular Ian Whitson who weighed in a mixed bag of 65lb from peg 17. Simon Hayes finished second with 62lb 6oz from peg 16. Section 2 was very close I managed a narrow win with 43lb 12oz mostly bream from peg 22. Don Lines was second with 42lb 8oz from peg 23 and John Williamson was third with 42lb 4oz from peg 24. To be fair John lost some big fish on the pellet waggler. 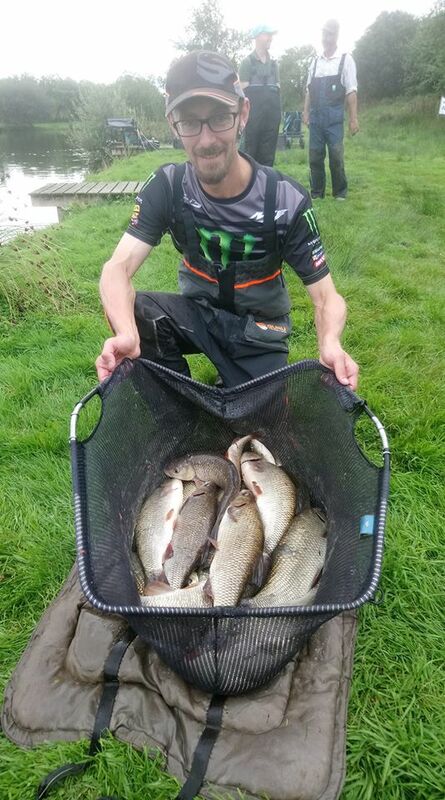 Section 3 was won by Jerry Blythe with a mixed bag for 65lb 10oz from peg 26. Rosen Arsov was second from peg 29 with 44lb 8oz. Shame the rain came in the last hour, nothing worse than packing up when everything is soaked. Well done everyone some very good weights. Open again next week please contact Broom Fisheries if you are going to fish.